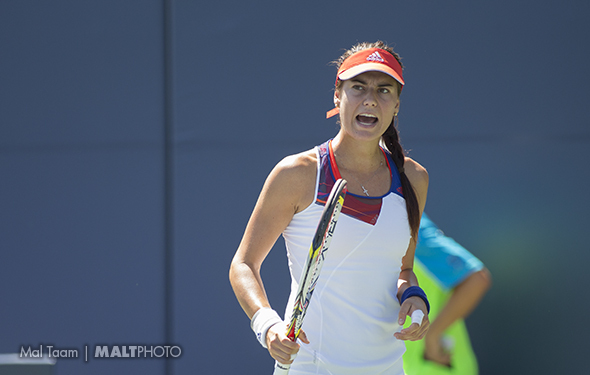 FROM THE BANK OF THE WEST CLASSIC AT STANFORD, DAY 3 – Sorana Cirstea went to Las Vegas again prior to another big swing, this one the Emirate Airlines US Open Series hard court segment. The Romanian and fifth seed has not had a great year and in fact she hasn’t won three matches in a row since February in Pattaya City. She will have a chance to do so on Friday at Stanford and seems refreshed and ready to go after her stint in Sin City, where she once again got to hit the greatest women’s singles player ever, Steffi Graf. The German was her idol growing up, so even though she has been visiting Las Vegas for adidas Player Development camps for the past seven years, she still gets nervous when they take the court together to hit. Cirstea just fell out of the top 30 to No. 32 but she has faced plenty of elite players before and believes that the 44-year-old Graf could still contend with many of them. Fortunately for Cirstea, she does not have to go up against the 22-time Grand Slam champ week in and week out. But there are plenty of other great players around the WTA these days and if she wants to realize her goal of eventually reaching the top 10, she is going to have to improve a good deal. The Romanian is already substantially better than she was say five years ago. She’s more patient, her big forehand is more accurate and she appears to be better balanced. She can stay strong off the backhand side and returns second serves aggressively. In her 6-3 6-3 win over CoCo Vandeweghe, she defended her own service games quite well (occasionally popping in first serves at 110 MPH), got enough of the American’s big serves back in play to get into the rallies, many of which she won as Vandeweghe was dealing with an aching back and was a bit slow to the ball and often wild. Cirstea worked hard in Vegas in 115 degree heat with trainer Gil Reyes (he of Andre Agassi fame) so she feels her legs are stronger and consequently she can set up easier and if she uses her lower body she can add a little more power. She also worked with the savvy coach Darren Cahill and adidas hitter (and former touring pro) Sargis Sargsian, both of whom were surely working with her on point construction. There are moments in matches when it does look like Cirstea can be a top 10 player and others where it looks like she could fall out of the top 50 again. She does have talent, but she can be erratic and at times loses confidence too quickly. She loves hard courts, but struggles on clay and on grass. She only won five matches during the clay court season and Serena Williams crushed her at Roland Garros. At Wimbledon, she let go of two tiebreakers in a second round loss to Camilla Giorgi. She says she fresh and hungry again and excited to be back on hard courts, where she had the most success. Se reached the Stanford semis last year, falling to Serena. She has a god chance to do it again as she will face the unseeded Olga Govortsova in the semifinals. If she can combine her skill set with a Graf’s mental toughness, she has an outside at her first big title. “I’m already starting to find my game again,” she said.